With so many different shapes, styles, fabrics and finishes on offer both on the runway and on the high street, it could be difficult to know where to start with women’s suits right now. The traditional two-piece is said to have died. It’s said the day of the ‘suit’ has gone. It’s a bold statement as there are still a lot of industries where a suit is required, and seen as almost uniform. I would still say it’s a mainstay essential for every women (and men’s) wardrobe, no matter what style you prefer or what shape you are but knowing what to buy to best show off your shape and personality can be a bit of a minefield. Have you ever avoided wearing a suit because you felt there were rules to be followed? Like wearing the jacket and trousers together or always pairing a suit with a neutral t-shirt or shirt? Well it seems 2018 has been the year to throw away the rule book on women’s tailoring and experiment. Hoorah. From nodding to the iconic tailoring of the 60s and 70s to mixing flower prints and brights. Pastels and sweetie tones by Gucci, Hermes and Michael Kors to wide legs and unstructured blazers on the high street. Even wearing your fella’s shirts is ‘in’ as Prada demonstrated in its autumn/winter 2018 Milan Fashion Week show; there are endless options which is why making friends with your tailor is the most savvy fashion advice these days. 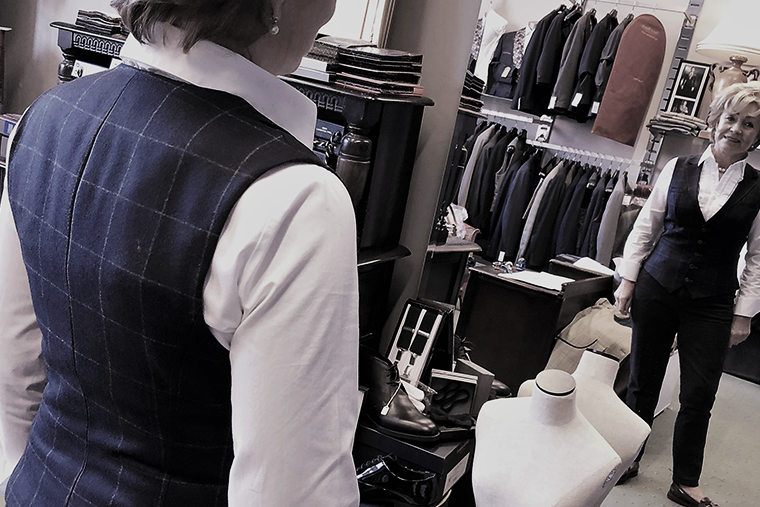 Your tailor will show you what suits your shape and skin tone and what styles are best for your size, as well as what’s fashionable. The fun we’ve had recently at Papa’s with waistcoats for women. Lots of ladies embracing the wonderful waistcoat. It’s a favourite of mine and I think I have probably about 20 now! #guiltypleasure. It’s a great way to smarten an outfit yet still add lots of personality and move away for the traditional woman in the office look. It does have to fit well though. Once fitted well then it can be worn with roll neck, blouse, t-shirt, jersey top. Endless options. My go to!